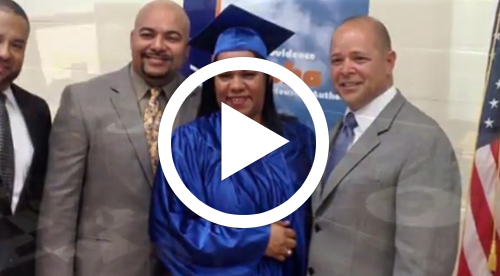 The Providence Housing Authority (PHA) not only provides safe, affordable housing to Rhode Island residents, its mission includes addressing residents’ economic needs and offering a bridge to a better future. But one-fifth of their residents don’t have Internet access at home – a key tool in finding and applying for jobs, signing up for an affordable healthcare plan, and continuing education. PHA developed a “Get Connected” program, an innovative public-private partnership among PHA, Broadband Rhode Island (BBRI) and Mobile Beacon. 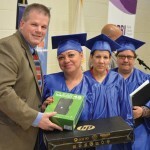 This pilot program began with six weeks of bilingual of digital and financial literacy training for 25 adult residents of the Manton Heights housing community in Olneyville. 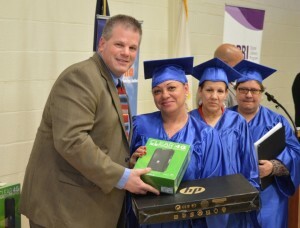 Participants who graduated from the program received a donated laptop computer, a donated 4G Wi-Fi modem, and six months of free Internet service from Mobile Beacon. At the end of the free Internet service period, residents may sign up for Mobile Beacon’s ongoing unlimited Internet service for $10/month through EveryoneOn.org’s platform. PHA’s bilingual instructor, Victor Ramos reports that students overcame their fear of computers and the Internet in just a few classes. One of his favorite outcomes was helping a resident who shared that she had applied for several jobs, but was feeling discouraged that she hadn’t heard back from the companies. Through talking with her, Victor learned that she did not know how to check her email. He showed her how to login to her email, and he saw a job offer from one of her potential employers. Victor showed her the message, helped her translate the text from English to Spanish using Google Translate, and she secured the job! For many residents, this program is the first time they have owned a computer and enjoyed private Internet access. They described heartfelt feelings of pride and accomplishment at the graduation ceremony, as well as a desire to continue the program. 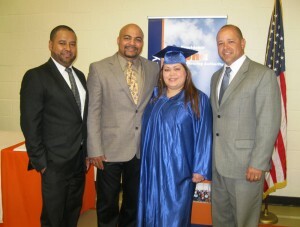 Graduates established a DigiClub so they could meet monthly and continue to share information and support one another. The pilot program also helped PHA secure a 2014 Olneyville Community Fund grant from United Way of Rhode Island, which they will use to sustain the Get Connected initiative.